Video above details some of the 'heroic' pages from the history of violence of disgraced Armenia MP, president of Football Federation, oligarch Ruben Hayrapetyan, nicknamed 'Nemets Rubo'. Other high profile MPs from ruling Republican party who supported firebombers and encouraged anti-gay violence include vice-speaker of the Armenian parliament, spokesman of the ruling Republican party Eduard Sharmazanov, and MP, (now) secretary of Republican party parliamentary group Hovhannes Sahakyan. 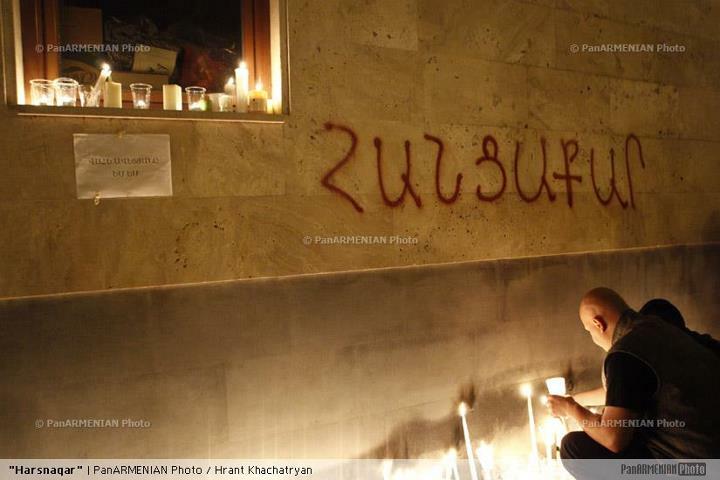 Last night, there was a candlelight vigil in Yerevan in memory of beating victim Vahe Avetyan. People gathered in front of the restaurant where the violence took place [Harsnaqar restaurant belongs to 'Nemets Rubo'] Many held 'I am Vahe Avetyan' posters condemning violence, calling for boycott of oligarch MP businesses and his resignation as MP and president of Football Federation. Among protesters rightly condemning violence, I noticed two well known personalities who have their share of moral responsibility for this atmosphere of hatred and violence. Armenian MP from the ARF Dashnaktsutyun party Armen Rostomyan said nothing when his colleagues from the ARF party, and in particular Artsvik Minasyan, Hrayr Karapetyan and Artur Aghabekyan supported firebombers and at least in case of Artsvik Minasyan (+ here) and Artur Aghabekyan openly encouraged anti-gay violence. Larisa Alaverdyan, former MP and ex-Ombudsman, effectively sided with homophobes during TV programme discussing attacks towards gay friendly bar and Diversity march. 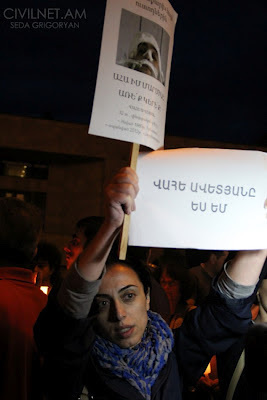 Below are two pictures from the candlelight vigil protest action via CivilNet and PanArmenian FB page. Մեկ այլ դեպքում, Ռուբեն Հայրապետյանը թմրամոլներին պատժելու իր մեթոդներն է ներկայացրել. Իսկ վերջերս էլ պատգամավորն ավելի էր «բացել» իր սիրտը.